Gen Xtinct: "The Frog Prince"
"Bake the hall in the candle of her brain." Recognize that bewilderingly intriguing line? If you do, then you just might be an extremely fervent Muppet fan. If you don't? Then you've got to run out RIGHT NOW and find yourself a copy of "Tales From Muppetland: The Frog Prince," Jim Henson's 1971 take on the classic fairy tale. If doesn't matter if you have kids or not -- it's that dang fun. We had the record of the TV special, and played it over and over and over, reveling in the story of little frog Robin, who claims he's really a prince, and the princess who's been enchanted by an evil witch, and can only speak gibberish. 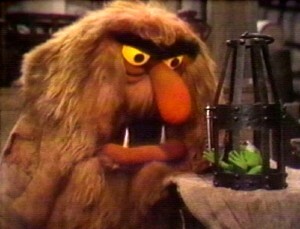 A skeptical Kermit's in it, and it marks the debut of Sweetums, the ginormous-monster muppet. How can you not love a story with lines like "Have another popover, froggy!"? And that mixed-up phrase about the candle of her brain? Spoiler alert: It's really "Break the ball in the handle of her cane." But if you've ever seen this great little romp, you already knew that. I'm hitting sere, quinking thietly, and ooking lat this ferry plower!